Summer is winding down, but it’s not too late to enjoy one of summer’s favorite fruits- the watermelon. Known mainly as a side dish at picnics that provides mostly water, watermelon is not just delicious but also chock full of nutrition. What kind of nutrition does watermelon offer? It’s true it has a high water content, so at over 90% water, it is a good option for hydration. It’s also full of potassium, vitamin C and vitamin A. Watermelon contains small amounts of magnesium, vitamin B6, and fiber as well. And at only 46 calories per cup, watermelon is great option for those trying to lose weight or maintain their racing weight. Watermelon contains many phytonutrients (compounds found in plants that are not vitamins or minerals but still provide health benefits), most notably lycopene, an antioxidant also found in tomatoes and known for promoting prostate and heart health, among other things. Watermelon also contains citrulline, which may help lower blood pressure and is of note for athletes specifically for a couple of reasons. First of all, some studies have found that consuming watermelon after exercise may help reduce muscle soreness. Secondly, citrulline may be converted to arginine in the body, which in turn can be converted to nitric oxide, which makes blood vessels relax. Why should you care? Well, nitric oxide is the same substance that the nitrates in beets are converted to, and which have been proposed to help improve exercise performance by allowing blood to move more freely to working muscles. So watermelon in theory could help improve sports performance just as beets do, although probably to a lesser level. Studies are inconclusive, however, and the amount of watermelon you would need to see a benefit may cause some, uh, other problems. Still it’s something to consider. More studies are needed! So as you can see, watermelon is a great post workout option. 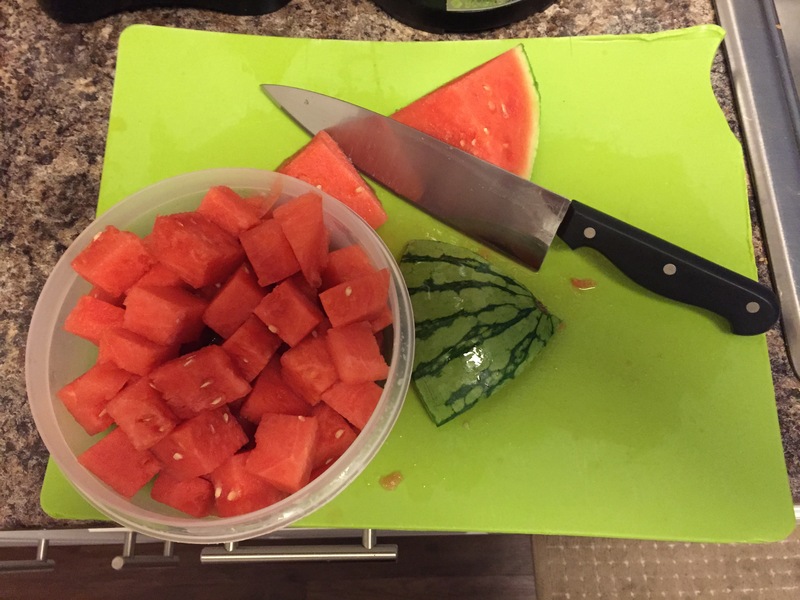 For a perfect post summer workout treat try this: cube a watermelon, sprinkle with salt, chill, and enjoy! Everything you need after a hard workout: fluids, carbohydrates, and electrolytes (ok hardly any protein but still pretty great) and it even sits well with an off kilter stomach. This entry was posted in Exercise/Training, Sports Nutrition and tagged watermelon, watermelon health benefits. Bookmark the permalink.